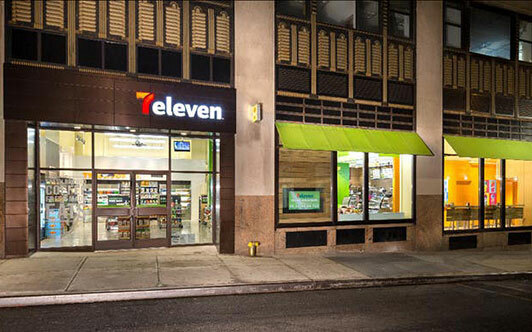 7-Eleven is a convenience store and gas station with more than 51,000 locations around the world. Their Big Gulps, Slurpees, hot dogs and other snacks are enjoyed by millions in 16 different countries. 7-Eleven has been known as a place for the not-so-health-conscious­; until now. The chain is beginning to change from the inside out. As 7-Eleven shifts its target demographic to health-conscious women and millennials, it realized it needed to change its identity. 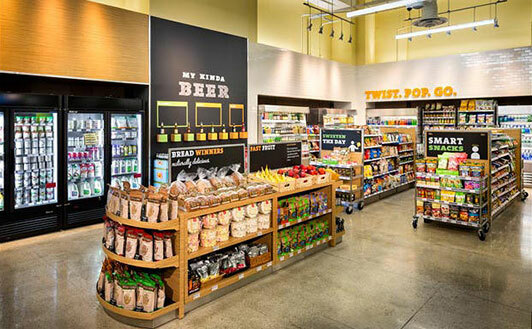 From an updated logo, to a new interior design, to restocking shelves with healthier options, 7-Eleven is continuing to transform its retail stores—thanks to a little help from WD Partners (Dublin, OH). 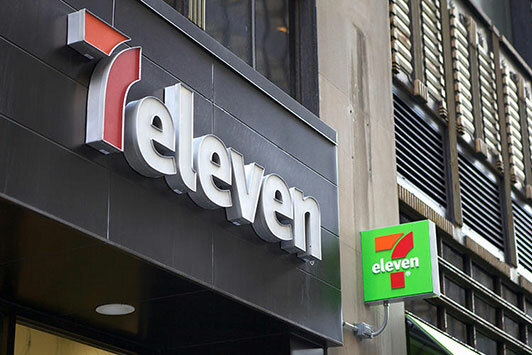 WD, a company specializing in customer experience for global food and retail brands, began to innovate 7-Eleven’s customer experience with a fresh update to the logo. The outdated, 43-year-old logo looked as though it was ready to retire, with its ever-present green and orange stripes and nocturnal, greasy rest stop feel. The new logo looks modern and fresh, while maintaining a connection to the former identity through the use of a red and orange color scheme and the numeral “7.” It places an all-lowercase “eleven” to the right of the “7”, except for smaller placements, when it appears across the seven on a bright green background. The fresh logo compliments the interior’s new, “green” feel. 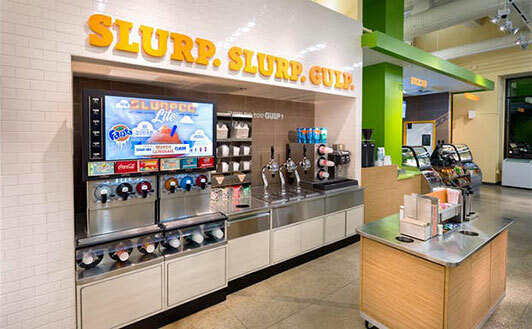 The overall design of the stores includes bright colored paint accents, white tiles, granite flooring, green furniture, and food stations marked with light, catchy sayings in simple serif fonts. 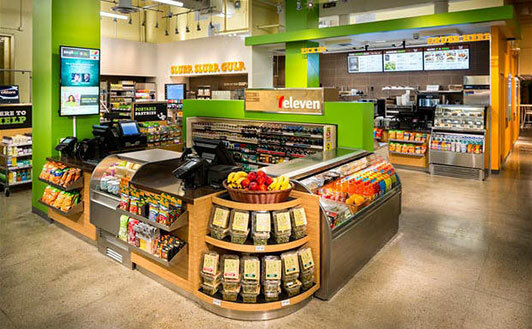 It appears as though 7-Eleven is trying to create an all-natural vibe, saying “so long” to processed foods and “hello” to healthier, freshly made edibles. 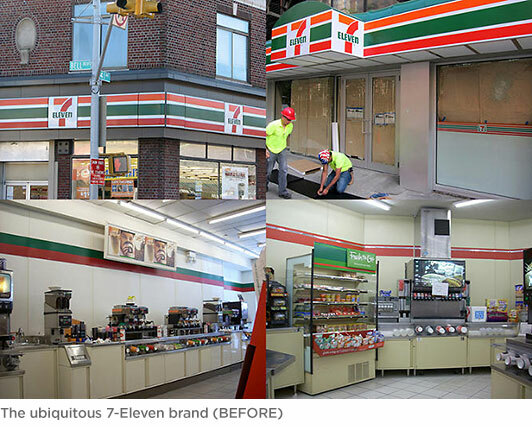 I am impressed with both the external and internal changes 7-Eleven is beginning to implement throughout its stores. Many retail stores advertise to try and fool their customers into believing they are achieving a healthier lifestyle; or change their look. 7-Eleven, however, is actually going beyond their fresh rebrand and revitalizing their menu to incorporate a new line of fresh foods, such as lean turkey and yogurt parfaits, while taking existing products and slimming them down into smaller portions. Not only does 7-Eleven’s new brand look good, but it tastes good and is better for you, too.